We provide picnic tables, a playground, 0.8 mile walking/running trail with exercise stations, baseball & softball fields, soccer/football practice fields, restroom facilities and a pavilion. Memorial benches and lamp posts are placed throughout the park. The park and facilities are maintained by a bevy of volunteers. 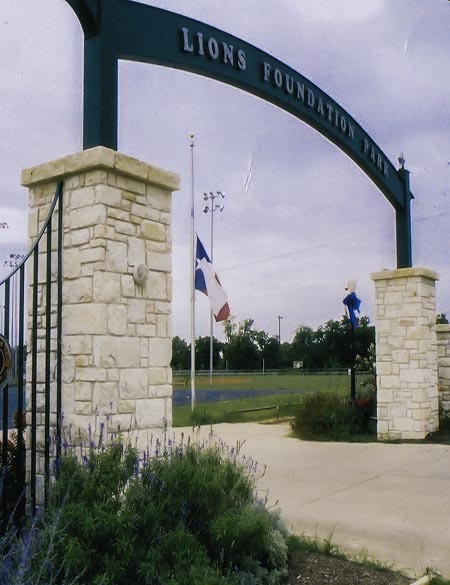 The restrooms, utilities, and ball fields are maintained by Liberty Hill Youth League (baseball/softball). The landscaping is maintained by LH Garden Club. The grass is mowed by the City of Liberty Hill. Thank you for all you do for Foundation Park. We always welcome new volunteers and donations to develop and maintain the park. The pavilion is available for rental; the park is available for events with permission. Contact Us for more info.